Hollywood actress Katie Holmes' Broadway performance has received mixed reviews after she made her debut in New York's Gerald Schoenfeld Theatre. 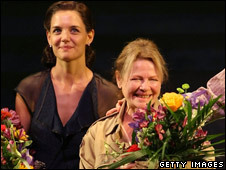 The actress wife of Tom Cruise plays Ann Deever in Arthur Miller's All My Sons which also stars Dianne Wiest, John Lithgow and Patrick Wilson. The New York Times' Ben Brantley said: "The show left me stone cold." Joe Dziemianowicz from The Daily News said the final act was "as powerful and plain-spoken as dramas get". Brantley said: "The leading performers make their entrances and exits glacially, in robotic profile, across the back of the stage. "When they speak, they often find themselves competing with anxious, portentous music, which might as well be a floating road sign marked 'Doom Ahead'." Speaking of Holmes' performance USA Today's Elysa Gardner, said: "She exhibits a girlish exuberance that could serve her well in certain stage roles." The 29-year-old plays the prospective daughter-in-law of a successful businessman who is revealed to have made his fortune selling defective aeroplane parts. Dziemianowicz said the actress made a "fine Broadway debut". He added: "Her rather grand speech pattern takes getting used to, but she seems comfortable and adds a fitting glint of glamour." The Associated Press said director Simon McBurney's vision "is grandiose, almost operatic in nature". All My Sons was first performed on Broadway in 1947.